Raised in the digital age, millennials hold the high expectations of a generation accustomed to instant gratification online. Ranging from retail to banking to healthcare services, they demand speed, quality, and personalized service—and their loyalties stand on current results, not past brand affinity. Reaching millennials—a demographic with the lowest rate of responsiveness to traditional ad campaigns—will require some unconventional thinking when it comes to crafting an effective campaign for your healthcare services. We’ve created a few guidelines to get you started. Unlocking the millennial mindset is crucial to your healthcare marketing campaign’s effectiveness. Here are some generational attributes that, according to research, make up this demographic’s outlook on health. Millennials, according to research, worry just as much as their grandparents when it comes to their personal health. A significant part of that concern is born of millennials’ use of the internet to research personal health issues and, quite often, attempt to self-diagnose. Why so much sleuthing? Millennials are information junkies, having grown up in an era when “Googling it” came to be seen as a natural precursor to fully understanding an event or an idea. Marketing to a health-info-obsessed generation means developing a campaign that recognizes the millennial need for instant answers. Position your brand as the alternative to “Dr. Google”: a resource to build their healthcare knowledge base through real-life consultations with medical professionals. Despite more than 60% of millennials regularly researching healthcare issues online, only about 40% believe that regular doctor visits are essential to maintaining good health. That may be because millennials are also frequently non-traditional thinkers when it comes to healthcare. Millennials look at health as a product of a wellness-centered lifestyle, one which may include elements of traditional medicine, fitness programs, and alternative therapies. To reach them, your campaign should present your healthcare service as a reflection of their “whatever works” mindset. Millennials are accustomed to a dizzying array of choices in the online retail world: they expect a “buyer’s choice” environment. They tend to develop loyalties based on immediate value, not brand image. They won’t care about a hospital’s 25-year legacy of providing exceptional medical services to their community if they have a hard time navigating the patient portal. According to a recent survey, millennials are just as likely to seek a different healthcare provider after a single negative online experience as they are to change hotels after an unsatisfactory stay. Use your healthcare marketing to show how hard your brand works to win your millennial audience’s business by detailing the efforts your health care system makes to offer a frictionless healthcare delivery process. Now that you understand the millennial outlook on healthcare, you’re ready to craft a message that will make them want to respond. While you may not know the difference between FOMO, JOMO, and fleek, you can still “speak” millennial and get your message across. Millennials are visual communicators. Image-driven social-media websites such as Instagram and Snapchat boast a user base that is 80% millennial; your place as a healthcare marketer is to develop a storytelling strategy that uses visuals as a key component of your brand’s healthcare services messaging strategy. Healthcare marketing campaigns that have found great success with this challenging demographic have tapped into millennials’ gleefully irreverent sense of humor when it comes to traditional ideas and institutions. An award-winning campaign by insurance provider Oscar Health used quirky images to poke fun at the millennial sense of invincibility and related to the need for insurance not as a need, but as a support for an active lifestyle. Millennials resist “lectures,” and healthcare marketing campaigns that use the off-putting “you ought to be health conscious” instead of the more appealing message “you are health conscious” are destined to fall flat. As millennials age, changing healthcare needs provide opportunities for marketers to promote relevant services—but doing this in a traditional way is a mistake. Millennials see healthcare as a critical component in their “adulting” process—a newer term referring to self-management of the changing responsibilities of adulthood. Present your provider’s health services as a toolset designed to help them optimize their already wellness-focused lifestyle and preserve that lifestyle through every transition of their adult lives. Your millennial audience should see affirmation of their role as “the grownup” in the client-brand relationship, choosing how their vision of lifelong wellness is expressed as a long-term health-care plan. There are challenges in connecting with a demographic often indifferent to conventional marketing campaigns. Book a free consultation, and we’ll share our insights to help you promote your healthcare services to the millennial healthcare consumer. Recent studies show that millennial healthcare consumers are highly skeptical of brand messaging and that many conventional marketing tools such as display ads and brand-focused sponsored stories are frequently ignored, and sometimes blocked at the browser. That doesn’t mean that millennials have “cut the cord” with healthcare marketing and branded content altogether. On the contrary, digital media—such as social conversations and information-centered health content—influences millennials more than any other demographic in their choice of healthcare services providers. Successful strategies take into account generational differences in the way 18- to 35-year-olds view healthcare as a whole and accommodate, rather than override, millennials’ native skepticism. Help them sell themselves on your services. How? Establish your provider’s relevance in the same way your audience’s pop icons do—on social media. Use first-person storytelling to anchor your brand’s value proposition to relatable figures whose stories reflect generational values and challenges. Integrate user-generated content—such as positive reviews and social video—into your campaign, but be certain that each social component enhances brand messaging. Highlight patient feedback that illuminates your brand’s care philosophy: A review that states that caregivers “were always happy to answer questions” is far less impactful than “the staff offered me a safe space in which I felt like my questions would be answered without judgment.” As much as 70% of millennial consumers choose their healthcare providers based on recommendations from friends and social network posts: Make sure your brand is present throughout the decision-making process. Leverage their communication skills to build rapport. Reimagine your online presence as an open door for millennials to share their views on the kind of health questions that they want to have answered in your branded content. Millennials spend hours online every day sharing ideas, images, and questions that relate to their immediate needs and moods. When these consumers are “in market,” whether they’re considering a new healthcare provider or seeking answers to a health question, they’re often online. Millennials’ empowerment as the creators of the kind of content that they want to read and engage with means that they won’t wade through posts that don’t immediately capture interest, even to find a needed answer. Millennials are answering each other’s health questions already; be the source that they share. Give them what they want in ways that they don’t expect. Use unexpected content formats such as infographics and short-format video to meet millennials’ need to cut through sales copy and uncover relevant facts while also satisfying their sweet tooth for immersive, rich content. They won’t necessarily be inclined to head to your homepage if they can get direct answers in seconds on Google—unless you’re offering them something more than the basics. High-impact visuals and condensed, relevant storytelling are the elements that keep millennials engaged; borrow from the best and make facts accessible in formats that are bite-sized and compelling. Attracting and engaging millennials can be challenging. Connect with us to book a free consultation to discuss your goals and strategies. We can help! Millennials are considered one of the most difficult audiences to reach with healthcare brand messaging, but perhaps the biggest challenge lies in overcoming some assumptions that hinder marketers’ consumer healthcare marketing strategies. Millennials are actually reading more books than other generations and they overwhelmingly prefer traditional print to digital media. 92% of college-aged young adults prefer print media to digital. 80% of all millennials would chose to purchase a paper book over a digital book if the price was the same. 76% of millennials read magazines monthly, with 86% reading print versions along with digital editions. 75% read newspapers weekly, and 77% of those millennials read a print copy along with online versions. How to speak millennial: Develop a strategy that uses print’s unique characteristics to creatively connect with millennial healthcare consumers when they are in “lean back” reading mode. An example might be the creation of a print ad that uses augmented reality (AR) technology to make an illustration of a telemedicine kiosk visit come alive as a 360 video when viewed through a mobile device. An AR-linked ad might also present a tear-out card that when scanned by a mobile device at a specific location—such as when a patient visits your hospital for the first time—unlocks an interactive, personalized “way-finder” video. They do believe an ounce of prevention is worth a pound of cure—it’s just that those “ounces” might be in the form of a health tech wearable or a few packets of “herbal cleanse” teas. For the millennial healthcare consumer, fitness and holistic wellness practices are not just an alternative to regular checkups with their doctor, they’re a lifestyle that defines who they are as a generation. 80% of millennials spend one-fourth of their disposable income on holistic wellness products and services like yoga classes and vitamin supplements. 54% of millennials visit a health-related website to “second guess” a potential diagnosis before visiting a doctor. 70% of millennials state that they are “doing everything” that they can to live a healthy life. Only 38% of millennials visit a doctor for preventative care on a regular basis. Source: Engaging Millennial Healthcare Consumers, Trajectory, 2017. How to speak millennial: Use millennial interest in “DIY” health maintenance to promote your health system as a “partner” in their wellness-centered lifestyle. Employ your social-media platforms to promote your health system’s expertise in developing personalized health plans that incorporate evidence-driven wellness practices. Present millennials with the kind of facts-focused health content and interactive educational tools that they love, and bring them back to your homepage for access to podcasts, free webinars, or more in-depth learning experiences that they’ll want to share. Millennials actually are thinking a lot about longevity and long-term quality of life. 72% worry that they will struggle to have their healthcare needs met when they become seniors. How to speak millennial: Promote your health system as a facilitator of lifelong wellness, showcasing your providers’ willingness to create long-term, individualized plans to prepare millennials for middle age and senior health challenges. 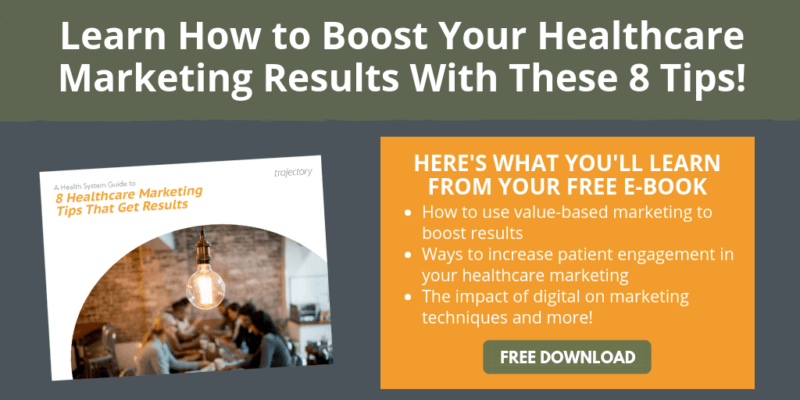 Highlight your health system’s strength in responding to the changing needs of patients with content that uses patient stories to showcase long-term wellness and longevity management resources. This might entail presenting more multi-generational accounts of positive patient experiences than stories featuring a single consumer. A family discussing their joint wellness journey over the years—for example a fit grandparent runs a marathon while a millennial grandson overcomes a sports injury to cheer him on—underscores your brand’s relevance to your millennial’s immediate and lifelong healthcare needs. Connecting with a tech-savvy generation of healthcare skeptics is challenging, but it doesn’t have to be overwhelming. Our data shows that the millennial healthcare consumer is reachable, and motivated to find the right mix of non-traditional wellness options and traditional medical care. We speak millennial—and we’ll translate your brand’s message in a way that resonates with your audience and inspires engagement. Connect with us today for a free consultation. Millennials might not pay attention to your TV spot or even encounter your print ad, but they are invariably online. This means that creating a successful millennial patient acquisition campaign requires finding and engaging them on social media. Snapchat, Facebook, Instagram, and other leading social platforms aren’t backdoors to access one of the healthcare industry’s hardest-to-reach demographics; they’re the first stop for in-market millennial consumers. Amidst the celebrity gossip, misinformation, and cute cat memes, say researchers, social-media platforms are where most millennials seek information and advice from friends before making critical healthcare decisions. Social channels are also the last place, recent studies show, that 18- to 35-year-olds want to see an ad, or overtly “commercial” branded content. That means your ads and branded content can’t feel like advertising if they’re going to work: Your campaign will have to mimic a “friend” relationship with your audience when it comes to content, even before you’ve been properly introduced. Like the ubiquitous selfie, you’ll need a brand “snapshot”: smart, context-savvy content that focuses on sparking social conversations around topics relevant to your providers’ stand-out qualities. But creating engaging content is only half of the battle: Knowing when and how to present it is critical to making audience impact last. The following tips will help you optimize your patient acquisition strategy while guiding you around some common pitfalls in millennial-targeted campaign development. Don’t make your campaign a slave to the format of a single popular social-media platform: Maintain a balance between high-impact videos, gifs, and powerful static content. Millennial consumers interact with healthcare brands online to access hard-to-find wellness information and share it with friends—not just because they’re cool hunting. Make sure your content can fit in seamlessly wherever your audience decides to post it. Blue Cross Blue Shield’s “eCards for Health” campaign is a good example of engaging, highly visual content that lends itself to sharing across multiple platforms. Don’t chase trending topics in social media: Focus on the wellness “big picture” driving millennial conversations. Millennials are two times more likely than GenXers and Baby Boomers to use social media to discuss health topics. Don’t waste an opportunity to present your brand as a reliable source of comprehensive health information and use that platform to showcase your provider’s healthcare options. Natural Language Processing (NLP) is now well integrated into Google search algorithms; structure your social content to match the way millennial consumers naturally look for information online. Develop a “before-you-ask” model for the content that you share. “How Can I Tell if a Mole is Dangerous” is a more search-friendly title than “4 Reasons to Have a Mole Examined” and will start more social conversations. When social-media content works, it works extremely well; according to recent research, consumers are more likely to seek out information about a brand and view that brand favorably after encountering engaging branded content. Creating content that keeps your audience attuned to your brand’s message is challenging: our team can assist. Connect with us to book a free consultation to discuss your goals. If you want to reach new parents, you’ll have to create a campaign that resonates with millennials. More than 90% of first-time moms are millennials, and 80% of births in the US are to 18- to 34 year olds. Millennial parent healthcare consumers are a fast-growing demographic with deep-seated beliefs about brands and wellness that inform their provider choices. According to recent studies, four brand attributes are key in a millennial’s decision to engage: authenticity, uniqueness, innovation, and meaningfulness. For millennials, authenticity is a business model, not just a buzzword. It means brands living and demonstrating their values and radical transparency in what they offer to their audience. To reach millennial parents with healthcare marketing (who don’t necessarily want to be marketed to), brands should look to create engagement and conversations. Shifting away from talking to consumers with sales-driven CTAs to creating catalysts for conversations. Millennials, raised by a generation of “helicopter parents” tend to believe that their consumer needs are unique and, as parents themselves, they want their children’s healthcare providers to treat their family’s wellness goals as such. That means that regardless of the size of the health system, marketers need to present their services as more “artisanal ” than “big box ”: Personalized pediatric services—ranging from fitness and nutritional programing to educational services for parents—should be emphasized. Above all, millennial parent healthcare consumers believe that every aspect of their family’s lives should be infused with meaning—a connection to their core value set. Social platforms are where millennials share parenting tips, consume user-generated health content, and consult influencers to make healthcare provider decisions. There is a great opportunity for marketers seeking to reach millennial parents through social media, considered a valuable parenting tool by more than 93% of the demographic. Just under 60% of millennials look to recommendations and reviews on social media as the primary influences in their decisions to interact with a brand. Leverage user-generated content to connect millennials with consumer stories that will resonate as “authentic” first-person accounts rather than message-driven branded content. Translating millennial values into creative strategy can be a challenge in view of this demographic’s deep-seated beliefs about brands and wellness. We can help. Connect with us today for a free consultation. Print is definitely not dead. Healthcare marketers focused exclusively on digital media are overlooking an opportunity to reach millennial healthcare consumers using print advertising and direct mail. Studies have shown for years that millennials often prefer digital customer-service experiences to real life ones, but that doesn’t mean that they’ll only interact with brand storytelling through their ever-present mobile devices. Millennials look at digital technology as a convenience tool, not a religion. Their attraction to it is use-driven. The focus, say researchers, is always the quality of “experience” in their consumption of content. In short, millennials aren’t just “cool-hunting”—looking for whatever is new and touted by generational influencers—when they choose to engage with ads or other forms of branded content. They’re looking for a higher “value-for-me”— an interaction that provides them with the information or entertainment that they enjoy, regardless of format. Unfortunately for digital marketers, millennials find the vast majority of digital ads fall into these categories: 18- to 35-year-olds are the most frequent users of ad-blocking software. Although digital advertising often disappoints, millennials are highly responsive to traditional print ads, even disproportionately so when compared to other generations. 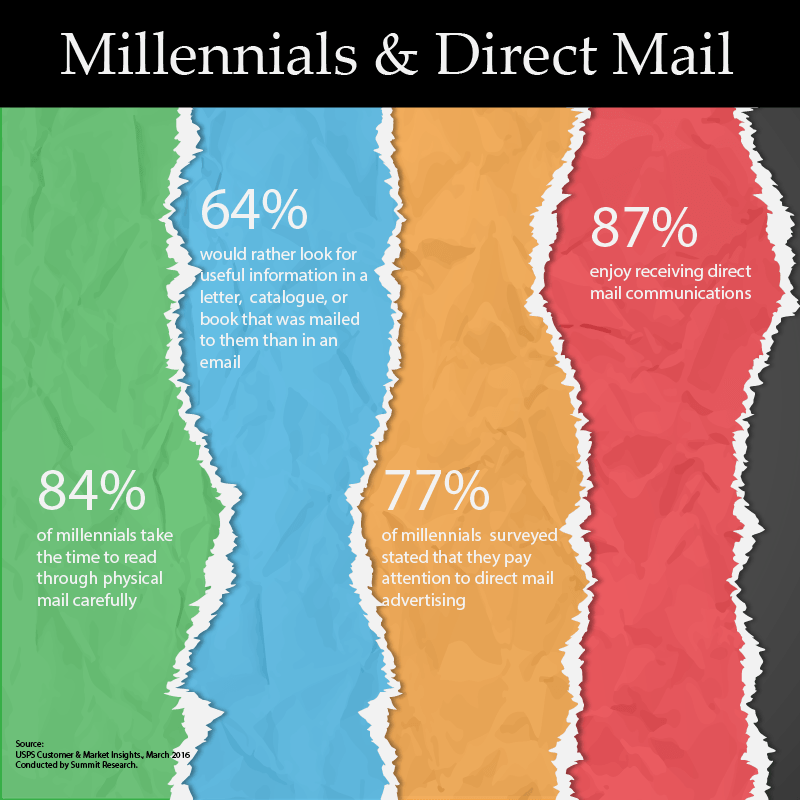 Millennials not only respond well to print and direct-mail advertising, according to recent statistics, they appear to actually enjoy it. Let’s take a look at the numbers. It gets better: 63% of those who responded to a direct-mail advertisement made a purchase in less than 3 months, according to a recent USPS study. According to a report by The Newspaper Association of America, 68% of millennials surveyed stated that they had recently read and experienced a reaction to print ads, and close to half made a purchase because of a product or service that they read about in a magazine. While magazines offer an engrossing, “lean back” content experience that makes them popular with millennials, you might not know that there’s a scientific reason behind print’s appeal to 18- to 35-year-olds. According to a recent study by Millward Brown and The University of Bangor, millennials state that print ads are highly engaging and feel more “meaningful” than digital ads. That’s because they actually are—at least on a neurological level. 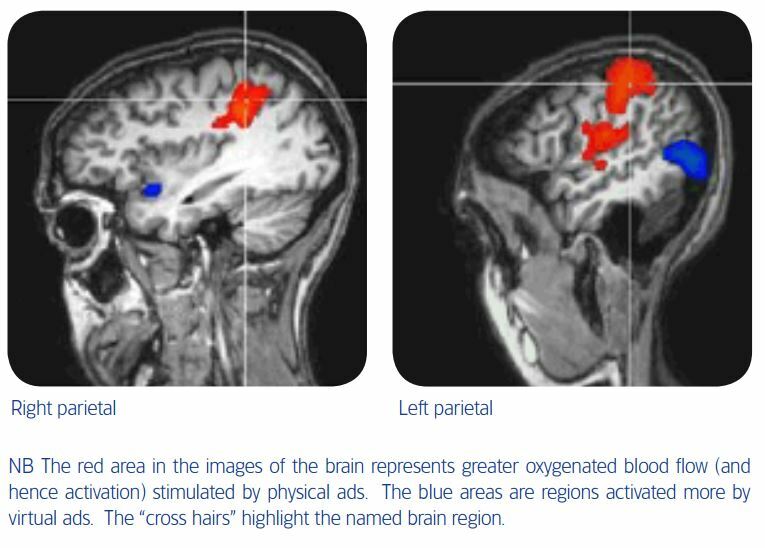 Images from Using Neuroscience to Understand the Role of Direct Mail, by Millward Brown and The University of Bangor. More parts of the brain are stimulated when a reader encounters a print ad, and according to the study that means that your audience is more likely to make connections between the ad’s message and their personal feelings. In other words, print ads are highly successful at prompting an emotional response. It’s no wonder that, according to the USPS study, print ad viewers experienced 70% higher brand recall than those exposed to digital ads. We know that print advertising makes sense if you’re trying to connect with millennial health consumers, but what elements make a high-impact campaign? Here are a few tips to keep in mind as you develop your creative strategy. Print ads can provoke emotional resonance simply by virtue of their format: Use them to share your healthcare system’s most compelling patient stories or relatable customer-based insights (the low numbers of millennials with regular doctors juxtaposed with their high rates of stress and untreated chronic illnesses, for example). When combined with fresh audience data and stunning creative, print’s impact will be multiplied, say researchers, especially if balanced with a strong digital campaign. Millennial consumers enjoy long reads (there’s even a millennial favorite, longreads.com), so combine direct-mail campaigns and magazine ad buys with your own original content. This might take the form of a ‘zine (a theme-driven, mini-magazine format popular with millennials) or a “pocket guide” that might outline health tips and resources while providing a way to tie-in digital interactions (such as a QR code, which allows an expedited check-in for an event or access to exclusive online content). Leveraging the power of print advertising—combined with digital and mobile—to reach millennial healthcare consumers can be challenging. But it’s well worth the expense given the opportunity to build their prospective future lifetime value to your organization. We can help. Not only do we understand millennials, we know what drives their healthcare decisions. Connect with us for a free consultation today.